It’s the bottom of the seventh inning. The previously spotless pitcher through six innings has just given up three runs and the crowd is quickly becoming disgruntled. No matter the brilliance of the performance in the prior innings, the cries from the fans are always the same; “Get him out of there!” “He should have been sent to the showers two runs ago.” Yet, the truth of the matter is that the call to the bullpen was made long before the shouts from the stands became audible. So why then does it always seem to take so darn long for that reliever to come to the mound? The answer is simple ... Warm Up! We would never expect, nor ask, a professional athlete to enter into competition without a proper warm-up. However, how many times can you recall asking this of your retriever athlete? In comparison to the human, the dog body certainly has significant differences in terms of physiology and structure. Yet, the function of the musculoskeletal system is incredibly similar. So much so, in fact, that the data extrapolated from many human studies is used in veterinary orthopedic medicine and vice versa. So why is it important to properly warm up muscles before training and competition? In light of extensive research with human athletes, we know that heating muscle tissue via exercise improves both muscle and tendon extensibility. This factor alone reduces the susceptibility to injury, as the more flexible the tissue, the less likely it is to be strained or torn. Increasing muscle temperature also improves oxygen utilization by increasing levels of hemoglobin, which is responsible for carrying oxygen molecules; the greater the level of oxygen available to the muscle, the greater the endurance of that tissue. Every muscle in the body is made up of several motor units. Each motor unit consists of one motor neuron that is responsible for contracting all the muscle fibers it is connected to. During activity, motor unit recruitment, or “activation,” is required in order for the muscle to properly contract. Activity based warm-ups facilitate this process by slowly “turning on” all muscle fibers in preparation for intense exercise. The illumination of stadium lights serves as a perfect example. After the initial switch is turned on, it takes several minutes for the lights to brighten to their maximum capacity. The same is true for muscle tissue. So how then do we properly warm-up the retriever athlete? What are the protocols we should follow? In all honesty, there is no one standard or perfect protocol. However, there are certain guidelines that can help us formulate a reasonable plan for our performance dogs. The most important part of creating a warm-up is to always consider what it is we are asking our canine to do and what will be required of their bodies to complete the task. We want to try to give the musculoskeletal system a “preview” of the activity it will be performing. For example, if our morning training consists of three 300 yard sprints, begin the day with a 5 minute sustained fast-pace walk or slow trot followed by two 30-50 yard bumper retrieve sprints. If the afternoon will be spent swimming across ponds, then allow for a quick 2-3 minute bumper retrieve swim. A sustained fast pace walk is defined as a walk in which the athlete is either on-lead or at a heel and walking continuously without stopping, as if the dog was walking on a treadmill. Consistent muscle contraction is the key to the warm-up walk/trot. Taking a dog for a casual walk and letting him run around is not the same as the recommended consistent contraction walk. Due to the intensity of most of these athletes, some of my clients have found that placing bumpers in the field provides for a safer warm-up when doing the sprint work. Many times throwing the bumpers results in a short, fast full out run but with a sudden stop and twisting turn which places excessive pressure on both forelimbs and hindlimbs. Competition days are somewhat different, as we all know. Finding the time and the space for warm-up activity is not always an easy task, especially when we have multiple dogs entered. However, any form of warm-up is better than none at all. Even if this means simply parking farther up the road from the line to enable a longer trek from the truck before running. A 3-5 minute sustained fast-pace walk or slow trot is the minimum level of activity every athlete should receive before competing. One rule of thumb I always tell my clients to try to abide by is a 2-3 minute sustained pace walk for every 45 minutes of inactivity on competition days. This ensures adequate circulation to the muscles and helps to prevent significant lactic acid accumulation. One of the greatest performance limiting factors for athletes is lactic acid accumulation. Lactic acid build up is a normal result of any strenuous activity. It is the primary component responsible for early muscle fatigue and soreness. When muscles, tendons, and ligaments become fatigued and tight, the risk for injury greatly increases. This is where a proper cool down becomes critical following intense exercise. The primary goal in cooling down the body is to promote recovery of the muscles by allowing for dissipation of waste products, such as lactic acid. During exercise, the degree of cardiac output, which is how much blood the heart pumps through the body, is substantial. A cool down following exercise allows for the muscles to continue contracting, while the cardiac output gradually declines. This ultimately helps prevent blood pooling in the muscles and subsequent tightness. An example of a sufficient cool down would be a 5-10 minute sustained pace walk following a training or competitive run. To stretch or not to stretch, that is the question! Thankfully, after years of research, we now have a reliable answer. Although stretching has been proven to enhance muscle length, flexibility, and overall athletic performance, we now know that all of these occur only after exercise, not before. In fact, several studies have shown that pre-event stretching does not reduce the risk of injury, but actually results in decreased muscle force, contraction velocity, and the ability to store elastic energy. We have learned that the greatest gains in flexibility are made only after muscles/ tendons/ ligaments are properly warmed up and when the athlete performed stretches on a regular basis. For our canine athletes who are required to perform sprints both on land and in the water, the greatest flexibility is required in their major fore and hind limb muscle groups, such as the triceps, quadriceps and hamstrings. Ensuring adequate muscle length is critical in order for the tissues to be able to respond to the exaggerated ranges of motion they endure during training/competition. There are several different stretching techniques we can utilize that target specific muscle groups. However, I am only going to discuss two of the stretches that I feel are the most critical for the retriever. Among all my retriever patients that are involved in retrieving I have yet to come across one who does not have significantly “tight” bicep and supraspinatus muscles/tendons. Although I am not surprised by this finding considering the degree of stress the shoulders undertake during training/competition, I do believe all of these athletes could benefit from a consistent stretching protocol of these tissues. The Bicep Tendon/Supraspinatus Stretch is performed with the dog in a standing position. Begin by flexing the shoulder and bending the elbow to form a 90 degree angle (Figure 1a). Then with one hand below the elbow and other grasping the carpus (wrist), slowly straighten the forearm (Figure 1b). Hold the stretch for 10 seconds. The Teres Major/Deep Pectoral Stretch is performed with the dog in standing. Begin by cupping the point of the elbow with one hand and grasping the forearm with the other (Figure 2a); then extend the forearm out in front of the dog while supporting the shoulder (Figure 2b). Hold the stretch for 10 seconds. Five repetitions of each stretch should be performed on both forelimbs at least three times weekly. The stretches are best completed following a cool down, when the muscles are still warm, but relaxed. In conclusion, as a canine sports medicine veterinarian, I am always seeking out the best ways in which to prevent injury in our canine athletes. The canine body is an amazingly forgiving structure that allows our dogs to perform extraordinary feats, but there are simple things we can do to help protect them as well. Warming up, cooling down, and post-exercise stretching are just a few, but in my opinion, some of the most important ways in which we can aid in injury prevention and enable peak athletic performance. Editors’ Note: Dr. Appel works at the Los Robles Animal Hospital in Tallahassee, Florida. Following some successful rehabilitation on field trial retrievers in the area, she presented a seminar this past winter for the Snowbird Retriever Club. 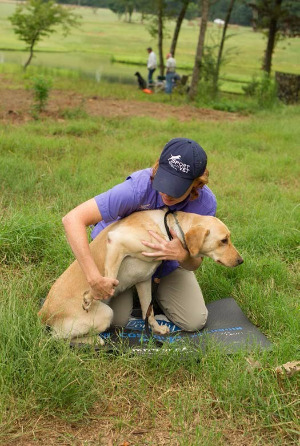 Subsequently, Jennell has worked with many more performance retrievers training in Georgia and Florida. She has been studying how we train and compete and is keenly interested in our dogs. We look forward to more information from her.